– New Multi-Routing feature (In-App Purchase) allows unlimited connections and effect chaining. – Presets let you save and share connections and the settings of the individual apps within your Audiobus workflow. – Multi-channel input hardware support. 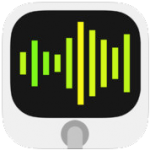 With a simple and clean interface, easily connect the output of one Audiobus-compatible app into the input of another. Use Audiobus to play a synthesizer live into a looper or multi-track recorder, or use one app to manipulate the live output of another. Note: We recommend using Audiobus with iPad 2, iPhone 4S or newer devices.